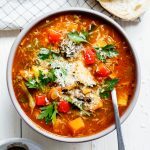 Everyone needs a good, easy vegetable soup recipe in their repertoire for days when you need healthy comfort food in minutes. Heat a few tablespoons of oil in a large pot and add the onion, carrot, celery and leeks along with the garlic and herbs and cook until fragrant and starting to caramelize. Add the peppers, butternut squash and mushrooms and cook for 5-10 minutes or until the vegetable start to soften and caramelize. Add the green vegetables and stir to combine before adding the crushed tomatoes and stock. Season to taste then bring to a simmer. Cover with a lid and allow to simmer for 15 minutes. Remove the lid, check seasoning and simmer for another 5 minutes. Serve topped with fresh parsley and Parmesan/vegetarian Parmesan.